Actors in "Papa John's Musical Garden"
Photograph of a male and female actor performing in the fall drama: "Papa John's Musical Garden. "; please see enclosure with 1998-01-5095 for cast list. Photograph of the cast members of dramatic production "Everyman," a amedieval morality play posing on stage; names and roles are listed on verso. Photograph of Dave Hammermaster and Gord Neilson dressed as shepherds in the Christmas play. Photograph of a male student and a female student facing each other on stage in the Calvin B. Hanson chapel, with the back of the crowd in the bottom crner of the photo. Photograph of a student acting in a dramatic performance in Freedom Hall. Photograph of a male student posing in a classroom, in his costume, as the hunchback. 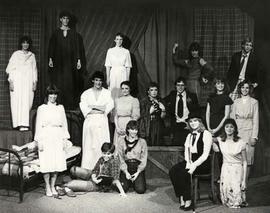 Photograph of drama students, some in costume, posing as a group on the stage of Freedom Hall; instructor Claire Goodfellow second from right. 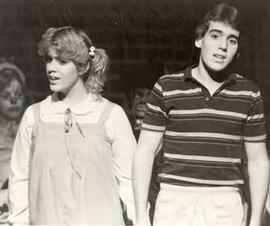 Photograph of four students acting in a dramatic production.